Black Bourton is a village and civil parish about 2 miles (3 km) south of Carterton, Oxfordshire. The village is on Black Bourton Brook, a tributary of the River Thames. The 2011 Census recorded the parish population as 266. RAF Brize Norton adjoins the parish. The northern boundary of the parish is along the middle of the main runway of the airfield. The Church of England parish church of Saint Mary the Virgin was originally built about AD 1190. The five-bay arcade between the nave and north aisle survives from this time. In the 13th century the chancel, nave and north aisle were remodelled, and the easternmost bay of the aisle was projected northward to form a north transept. Early English Gothic lancet windows in chancel, nave and north chapel date from this time. The north doorway of the north aisle dates from the 14th century. In the 15th century the bell tower was built into the nave and the stone pulpit was built. By the end of the 16th century the north transept had become the memorial chapel of the Hungerford family. Built into the north wall is a substantial stone monument to Eleanor Hungerford (died 1592): a recumbent effigy framed by Corinthian columns. The chapel also includes an English Baroque cartouche to Anthony Hungerford (died 1703) on the west wall. Black stone plaques on the floor record other members of the family. The building was restored under the direction of the architect E.G. Bruton in 1866. During the restoration a number of late 13th century wall paintings were discovered inside the church. At the time these were whitewashed over again, but in 1932 they were uncovered again and restored. On the south wall is St Richard of Chichester with, below, the Adoration of the Magi, the Massacre of the Innocents, and the Angel appearing to St Joseph, all with foliage borders. On the north side of the nave over the arcade are paintings of the Tree of Jesse, St Christopher, the martyrdom of St Thomas Becket, the Coronation of the Virgin, the Baptism of Jesus, Saints Peter and Paul and the stoning of Saint Stephen. The church is now a Grade I listed building. By 1757 the tower had a ring of five bells including the sanctus bell. Henry I Knight of Reading cast three of them including the tenor bell in 1618–19. Henry III Bagley, who had bell-foundries at Chacombe and Witney, cast the third bell in 1743. In 1866 Mears and Stainbank of the Whitechapel Bell Foundry re-cast the second bell, which had long been cracked, and added a new treble bell. The frame is oak, was made in the late Middle Ages and by 1965 required replacement. In 1966 the tenor bell of 1619 was transferred to the parish church of St John the Evangelist in Carterton. The bells remaining at St Mary's were unringable due to the condition of the frame. In 2017, the bells were restored and one was replaced. St Mary's churchyard includes 31 Commonwealth War Graves Commission burials. There are 30 Second World War burials and one from the First World War. Most of the Second World War graves are of members of the RAF and allied air forces from RAF Brize Norton. The parish is now part of the Benefice of Shill Valley and Broadshire, which includes also the parishes of Alvescot, Broadwell, Broughton Poggs, Filkins, Holwell, Kelmscott, Kencot, Langford, Little Faringdon, Shilton and Westwell. A Primitive Methodist congregation was established in the village in the 19th century and built its own red brick chapel in 1861. The influential romantic novelist Maria Edgeworth was born in Black Bourton in 1767. A cul-de-sac in Carterton is named "Edgeworth Drive" after her. The painter William Turner was born in Black Bourton in 1789. Bourton Place was the manor house of the Hungerford family. It was demolished in about 1800. The village school was designed by the architect Sir George Gilbert Scott and built in 1865. In 1873 the East Gloucestershire Railway between Fairford and Witney was opened. It provided Alvescot railway station 1⁄2 mile (800 m) west of Black Bourton on the road to Alvescot. The Great Western Railway took over the line in 1890 and British Railways closed it in 1962. Black Bourton has a gastropub and hotel, The Vines. ^ "Area: Black Bourton (Parish): Key Figures for 2011 Census: Key Statistics". Neighbourhood Statistics. Office for National Statistics. Retrieved 19 October 2014. ^ a b c d e f Sherwood & Pevsner 1974, p. 458. ^ Marshall, Anne (5 March 2013). "The Baptism of Christ/SS.Peter & Paul: Black Bourton, Oxfordshire". Medieval Wall Painting in the English Parish Church. ^ a b Townley 2006, pp. 94–99. ^ Marshall, Anne (5 March 2013). "The Coronation of the Virgin, Black Bourton, Oxfordshire". Medieval Wall Painting in the English Parish Church. ^ Marshall, Anne (5 March 2013). "The Stoning of Stephen: Black Bourton, Oxfordshire". Medieval Wall Painting in the English Parish Church. ^ Historic England. "Church of St Mary the Virgin (Grade I) (1367683)". National Heritage List for England. Retrieved 21 October 2014. ^ "Black Bourton (St. Mary) Churchyard". CWGC. Retrieved 7 July 2016. ^ Archbishops' Council (2010). "Benefice of Shill Valley and Broadshire". Church of England. Retrieved 28 June 2013. ^ a b c d Sherwood & Pevsner 1974, p. 459. ^ "Black Bourton". Oxfordshire Churches & Chapels. Brian Curtis. Archived from the original on 1 December 2009. Gilbert, David; Blinkhorn, Paul (2008). "Excavations West of St Mary's Church, Black Bourton, Oxfordshire: Early, Middle, and Late Anglo-Saxon Activity" (PDF). Oxoniensia. Oxfordshire Architectural and Historical Society. LXXIII: 147–160. ISSN 0308-5562. Lupton, Mary. 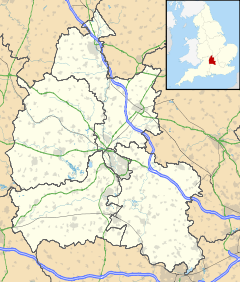 History of the Parish of Black Bourton, Otherwise Called Burton Abbots, in the County of Oxford. Oxford: Oxfordshire Archaeological Society. Sherwood, Jennifer; Pevsner, Nikolaus (1974). Oxfordshire. The Buildings of England. Harmondsworth: Penguin Books. pp. 458–459. ISBN 0-14-071045-0. Wikimedia Commons has media related to Black Bourton. This page was last edited on 9 March 2019, at 16:53 (UTC).